This article was originally written by Keegan Pope and appeared in The Rocky Mountain Collegian on February 27, 2015. It has been republished with the author’s permission. It’s 2 p.m. on a Tuesday. With a crucial Mountain West conference match-up against New Mexico looming nearly seven hours away, Colorado State forward Stanton Kidd is sitting courtside at Moby Arena, intently watching the action on the court. He isn’t watching practice, nor one of his teammates shooting around. The redshirt senior from Baltimore is instead watching one of his best allies, CSU women’s basketball point guard A.J. Newton, as she goes through strength and conditioning drills. After having her knee scoped earlier this season, Newton has been going through rehabilitation treatments a few times per week, with Kidd in attendance to encourage her when he’s able to make it. He doesn’t say too much, but his presence is just enough to give Newton that extra push when she needs it. Little did he know, that slight endorsement went a long way in Newton’s mind. 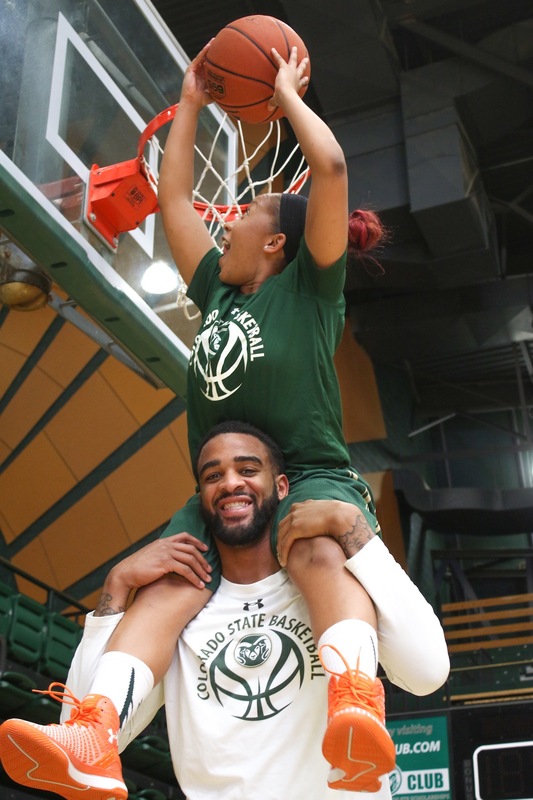 The duo met in the summer of 2013 when both were required to take summer courses after transferring to Colorado State. Kidd was at his third school in four years, previously attending Texas’ South Plains Junior College before transferring to North Carolina Central for one season. Newton came to Fort Collins by way of California’s Foothills College, where she spent a season after leaving San Jose State, where she stayed a year. Like many of their student-athlete peers, Kidd and Newton were taking summer courses to get ahead in their school work so they could take a lighter class load during their respective seasons. Unlike many of their peers, though, Kidd and Newton were already “grown,” as they like to say. Most of the students in their classes were freshmen, while they were in what would be their third and fourth years, respectively. After some conversation, they connected on basketball, too. During one of his off-season workouts, Kidd noticed Newton come into the gym, where they struck up a conversation. “I saw him in the gym one day and I went in there to shoot and he was like, ‘I’ll rebound for you,’ and that’s kind of how it started,” Newton said. The pair then spent most of that summer together, whether it was in classes, on the court or just getting food during their downtime. But before the 2013-14 season began, Kidd was required to have surgery, which included putting a steel rod into his leg after suffering a stress fracture. For the first time in his life, Kidd was unable play the sport he loved and faced a long road to recovery. By his side was his sidekick, constantly pushing and encouraging him as he began to walk, run and eventually participate in practices again. Unable to travel with the men’s team on the road due to his status as a redshirt following his transfer from North Carolina Central, Kidd instead spent his downtime watching from the stands as Newton and her teammates on the women’s team rolled through Mountain West play to a 25-8 record and the program’s first league title in more than a decade. “He probably only missed one game the year he sat out. And when he did I was like, ‘How come you weren’t at my game? Like, how could you? Some friend you are,”’ Newton joked. The time off the court was hard for Kidd, but he points to their budding friendship as a big part of what kept his spirits high during the rehabilitation process. Little did he know though, the roles would be reversed when Newton faced a similar struggle this season in mid-November when she injured her knee, requiring surgery that would keep her sidelined for nearly two months. With as much time as the two spend together off the court, most people initially think the two are in a romantic relationship, instead of having the brother-sister bond they share. They can’t count how many times someone has commented about them being a couple, only to find out they are each other’s greatest ally, most important confidant and best friend. There is irony however, as it is none other than Newton who set up Kidd with his current girlfriend and one of A.J.’s closest friends, Monique Coble. A little over year ago, Newton posted a picture with her and Monique together, which caught Kidd’s attention. The two have been dating for nearly a year, visiting each other and spending as much time together as they can when schedules permit. With Coble living in California and Kidd and Newton living in Fort Collins, she is only able to visit so often, which means having to split time with the two of them, something they’ve learned how to deal with after a little trial and error. It took some time to work out the kinks, especially after the first time the three were together in Fort Collins. Both Kidd and Newton will admit they were a bit hesitant to give up time with Monique with how little time they are able to spend together. Kidd pauses with a smile.